Paul from Caladon East, Ontario, wrote to report ... I spotted a Possum wandering my back yard at around 8:30 pm, when my security light was activated. The light had been activated several times over the last week so I believe it's been around for a while. A reader from Woodbridge, Ontario, wrote to say ... We saw a Possum on our porch tonight at around 9:15 pm, Sept 25, 2016. We had left some cat food on the porch and it was eating it. We have 3 feral cats that come to eat every day. I guess it isn't scared of them as they are usually always on the prowl. 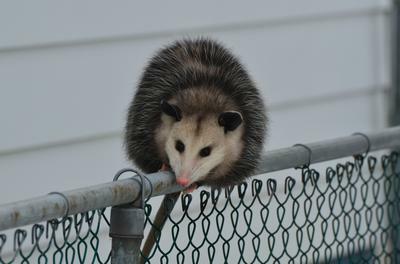 Carol Rowland from Oshawa wrote ... On Sept 26, 2016 at 12 midnight, I turned on my outside light and there on my back deck was a Possum. He was about the same size as my cat and his colour looked to be white and gray. He seemed to be somewhat stunned by the light but when I opened the door he quickly ran off. Some animal had been into my garbage earlier in the evening, I thought it probably had been a Raccoon, but no doubt it was the same Possum coming back for dessert. I had no idea they were living so close to me! Judi from St Catharines said ... I took our little dog out for late night walk. Can't let her out in the back because of the Raccoons. There was a Possum sitting in the front yard. We have also found several dead ones under our deck at the back of the house. A reader from Orchard Park Blvd and Penny Lane Toronto, wrote ... saw one, very pale ... not too scared but quickly moving to avoid encounter....5:30-ish am. On Sept 29 Karen from Brantford said ... So about 2 weeks ago at about 8:30 pm I looked outside and to the side of our deck I saw "something"!! I described it to my husband and he said it was a Possum. Just to re-confirm what I saw, 2 nights ago at about the same time, our new visitor walked across our back deck so we got a really good look at it, and yes sure enough it's a Possum!! I love wildlife but not so much in my backyard. Our newest critter is in addition to the Skunk and Raccoon that periodically cross our deck. And in case you're wondering ... we live in the heart of the city. If I look out some night and see a Deer I'll probably have a heart attack!! Sept 30 Mary Miron from Scarborough wrote ... This summer I've had Raccoons, a Groundhog and a Skunk visit my yard, but never in my life did I expect to see a Possum! While waiting for my ride to an early morning appointment, I was shocked to see a Possum come running up my driveway. When it saw me, it ducked under my car and vanished. I just hope it sticks around and joins the rest of the critters that frequent my back yard. Sept 30 Michelle from Burlington said ... I just ran into a huge Possum in my driveway, he ran away and my dog chased him into the backyard but thankfully was able to catch him! Kim from Burlington said ... I let our Jack Russell out at night and she was barking as if she had spotted something. There she was face to face with the Possum. I called her back into the house. We now take her out on a leash to avoid skunks and possums. John M Kennedy, also from Burlington said ... Tonight I watched a possum for 15 mins in the front garden of an Aldridge Crescent house, Burlington, Ontario. It grubbed around in the lawn, under a tree, and found something to eat. The observation was from 5 to 10pm to about 10 past 10 pm. It was about 150% the size of a large cat. The tail was about the same length as the possum and like a crooked stick, and largely hairless. The head was white and the body dark gray. Sept 30 – Jenn from Courtice wrote to say ... Standing on the back deck tonight when I looked down and what I first thought was a huge cat, was a POSSUM!!! He/she didn't seem afraid at of of my presence and snuck up on me. He/she stayed at my side for a moment before walking away. Sept 28 Laurie Schneider wrote ... I just saw a Possum in Langley, BC. behind our house in the green space. My dog chased it out of the bush and it hissed at the dog, I called my dog to come to me and she left the Possum alone. I watched it as it circled around a few times walked back and forth for a few minutes then went back into a bush.